Let's Talk Alias: Is there a revolution? I love a good post-apocalypse show as much as the next guy, but they often attract a lot of criticism from people who bang on about how wrong all the little details are. "Jericho" was cancelled much too soon, IMO. 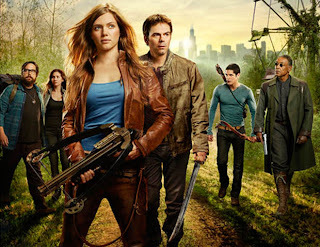 I watch "Falling Skies", which will get at least a 3rd season. "Terra Nova" should have been amazing and yet somehow it wasn't. We'll see how audiences embrace "Revolution", but already people are saying "where are the steam engines? ", "why aren't there any roads?". Post-apoco is a hard audience to please. "The Walking Dead" is EXCELLENT television. It was a lonnnggggg wait from that 6 eppie first season until S2 kicked off. And, now, we're darned near ready to launch S3. I don't know thing one about the comics the series is based on, but I gather that some epic changes are in store this year. Bring it. Totally agree Page. I wasn't sure if I would be into a show on zombies, but I watched the first episode and when Rick wakes up the his whole life is upside down, it was like "Syd, you've been missing for 2 years." New "Skyfall" trailer making the rounds today. Meanwhile, yesterday's big excitement was a new "The Hobbit" trailer. I finally caught up with this week's "Covert Affairs", where Annie meets up with Simon's sister, Zarya (played by "Alias" alum Agnes Bruckner, "The Box": Parts 1&2). And, how about Dark Annie, going rogue in Russia, and getting off a few rounds in the process!! Now, she has 4 weeks to find a way home. "Nikita" debuted on Sept. 9, 2010. Season 2 arrived on Sept. 23, 2011. Now we have to wait until Oct. 19, 2012 for S3 to commence. At this rate, S5 won't start until Christmas. For now, we're all confined to teaser town. I tried posting a version of this "Hunted" promo video a few hours ago, but it looks like Homeland Security (aka Blogger) flagged it, tagged it, bagged it and gagged it a few seconds later. They used to wait until I had 6 links in a post before wiping it. Obviously, they've upgraded their software package to DeletePost Pro 2.0. I've concluded that linking to Cinemax Youtube vids is the common thread in having my recent posts deleted within seconds, so here is the same video for "Hunted" that I posted earlier this morning, only this time, courtesy of Seriable.com. Not much love from me for Revolution. I just finished Hunted. I caught it online. Not real impressed. It is a little too British for me. Not enough humor and action, too much feisty interpersonal stuff.